Happy spring, happy sunshine, happy open-toe sandals and of course, Happy Easter! 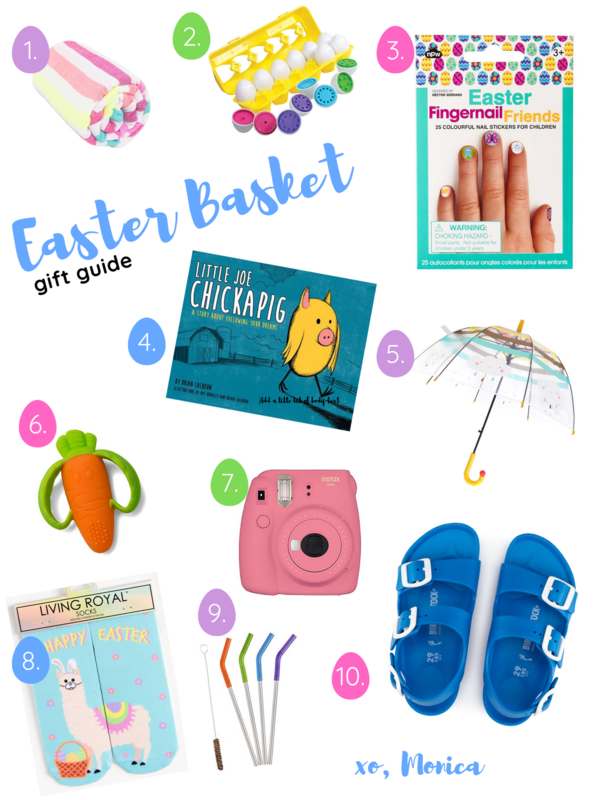 Today I am bringing you ideas to plump up those Easter baskets with goodies that your babes, kiddos and even tweens will want and need. My intent is always, always to offer gift options that fall into one (or more) of my 5 gifting categories: novel, useful, personal, lasting or experience. While I love all the colorful chocolates and sweets that come with this holiday, I do think there is room to switch out an item or two and offer up goodies that can be enjoyed once all the eggs are found and the bunny has hopped on to the next carrot patch. 1. A beach towel :: The one pictured here is my personal fave and may be more than you want to spend for a kiddo, but it doubles as a picnic blanket or even a spring duvet! The general idea is a fresh, colorful towel for the new season that can be used for future pool parties and swim lessons come summertime. For an added touch, monogram a name or initials. Useful, personal. 2. Egg Matching Toy :: This one is for the tiniest egg hunters. It fits the theme and offers hours of fun and learning. It is a great addition to a play kitchen once the basket is put away. Novel, useful. 3. Easter Fingernail Friends :: Colorful nail stickers are a sweet, sugar-free treat and don't involve real nail polish headaches. With cute butterflies, chicks and friends these work for spring into summer. AND, they actually stick to nails for more than just a day. Novel. 4. Little Joe Chickapig :: My kiddos will find this unique and entertaining story about following your dreams in their baskets this year. This is a new children's book (just released March 10th) so it's a fresh adventure featuring Chickapig, a space-traveling mouse and musical dragon. It can be found exclusively at Target. Don't forget to write a note and date the inside before gifting! Novel. Useful. 5. Umbrella :: Spring showers bring May flowers so get them ready! Tuck this unexpected treat into their basket and notice if they start asking when it's going to rain! Useful. 6. Carrot Teether :: Baby bunnies need carrots too. This adorable teether couldn't be more perfect for an Easter basket and beyond. BPA-free and easy to double fist while chomping. Novel. Useful. 7. Instax Camera :: You've seen this one before, and you'll probably see it again. I won't rest until everyone owns one of these. Haha! They're a great basket idea for a tween or teen that may think they're too big to partake in the fun. Toss in a couple of packets of film and watch them capture their own Easter memories. This is especially entertaining for those kiddos, like mine that don't own a phone yet. Useful. Lasting. Experience. 8. Easter Socks :: Socks are always a welcome treat and the crazier, the better. Useful. 9. Reusable Straws :: This is the Easter treat they didn't even know they wanted! Doing good for the Earth while keeping that sipping game strong. We've had these since December and they are super easy to clean and use again and again. Novel. Useful. Lasting. 10. Water Shoes :: Are you starting to see the trend here? Think past the holiday at hand and look towards the items you'd already be needing to buy your peeps for the summertime. A cool pair of water shoes or sandals has your crew ready for the pool or vacation. Useful.